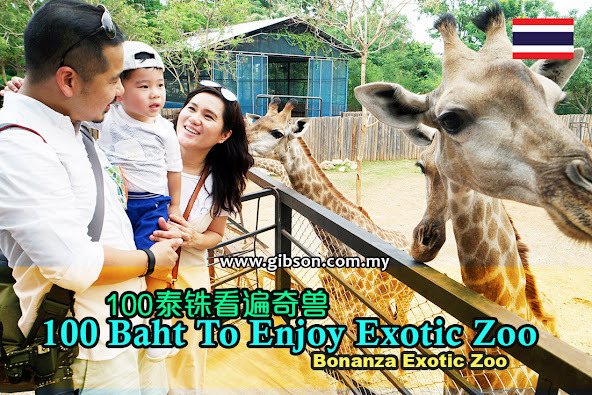 For only 100 Baht (around RM13), you get to see many exotic animals across the globe and get close to them. That’s why Bonanza Exotic Zoo is a must visit destination if you are to go to Khao Yai, Thailand. Malaysian celebrity Wan Wai Fun and her family is the ambassador among 6 other celebrities and their families from other countries for the family fun Thailand program that was launched recently. Khao Yai is a town that is situated among mountains and forest, which is an ideal habitat for animal. This is also the reason why one of the most popular activity here is visiting farms and Zoos. The animals in Khao Yai also very friendly to humans, they will try to get close to you. Don’t jump to the conclusion that the animals are being friendly just because of food. They indeed do come for food, but they are not desperate, they are just excited. Gibson’s first destination in Khao Yai was to Bonanza Exotic Zoo that covered around 15 acres of hilly land. With 700-meter circular walkway through the, you just need 40 minutes to walkthrough the zoo. If you are too lazy to walk, you can pay 50 Baht per person to hop onto a buggy for a 20 minutes round trip. However, Gibson strongly suggest that you walk through the zoo, as you will be so excited with the animals to even feel tired. You can feed the animals in the zoo, but only with the food that is purchased from them. If you had watched the cartoon “Madagascar”, then lemur is no stranger to you, and you can find several species of lemur here. Alpaca is one of the more popular animals here, remember to feed them for a good selfie. These are not mice nor kangaroos, although they are also originated from Australia, but they have a different name as wallaby, and way smaller than kangaroos. When Gibson spotted the Harry Potter’s house, he was sure that the house is the home of owl, but they don’t entertain guests during the day. Are giraffes shorter now? No, we just happened to be standing on a raised platform. Our national treasure – Orangutan is the best gymnast of the zoo! Besides all the real animals, you can spot some art pieces here too.